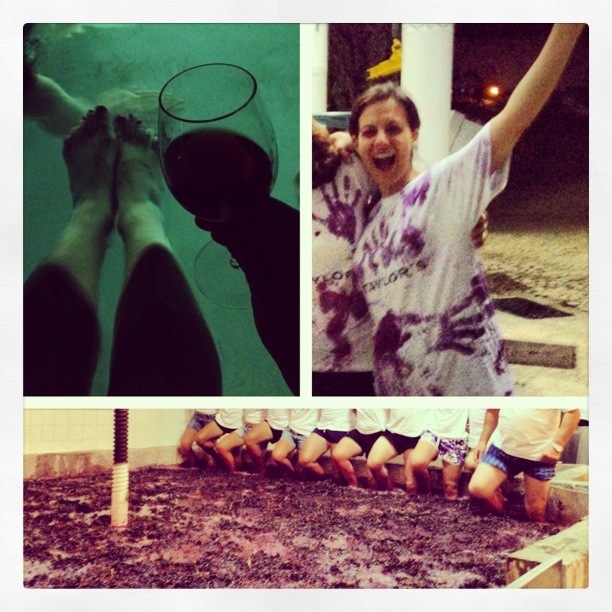 This time last year I was foot treading grapes for vintage port at Taylor’s in the Douro Valley. Was suuuuper fun! Full posts here plus a pretty freaking hilarious video of chicken dancing in the lagar. Tags: port, Portugal, throwback thursday, wine. Bookmark the permalink. Previous post ← julianne moore is awesome. guess why. I am so jealous! Have always wanted to stomp the grapes like I Love Lucy. Brought back memories – my grandmother used to make wine for the family way back when. One year I got to stomp grapes. I was 11 or 12. They were in a big tub or trough. We didn’t have any extra to throw away so she used them to make wine – I have no idea if my feet were clean when I started. HA – we washed our feet first in a solution, but the temperature during fermentation kills off absolutely anything anyway. I’ve always wanted to do that! Looks like you had a lot of fun too. And to think I might have been drinking the “fruits” of your labors at Taylor this summer. What a lovely memory. Fun, too. Thanks for sharing. I’ve always wanted to relive the I Love Lucy scene–I love it!